From the booking process to the actual junk removal, we make everything as easy as we can for all our customers. We pride ourselves on offering the highest possible customer service at the lowest possible price. For a guide to cost, check out our price-by-volume estimator. 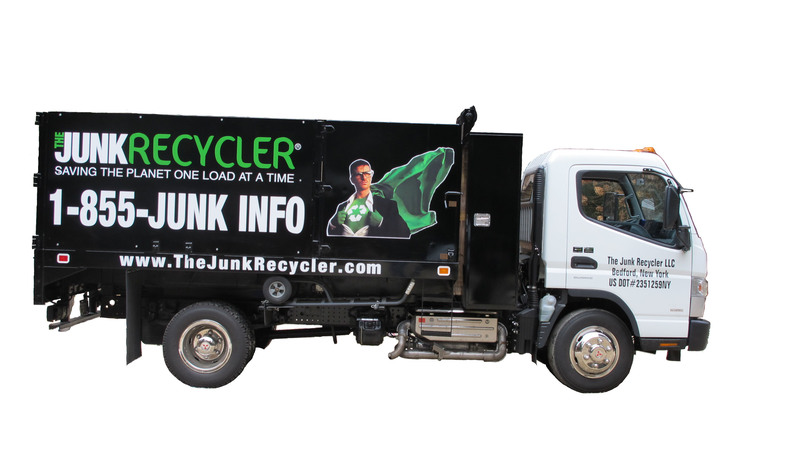 Our polite, professional and understanding staff will promptly meet all your junk removal needs. We appreciate the opportunity to serve you and are thankful for your patronage. Call us on 203 914-6185 or 1-855-586-5463 or book online to schedule an appointment. You will receive email confirmation that we have received your booking. On the day of your appointment, our friendly and professional team will call 15-30 minutes before they arrive. Upon arrival, our Recyclers will provide a no-obligation quote. We will load all the items you want removed— furniture, appliances, TVs, construction materials—from the garage, attic, basement, office. We do it all. With our dedication to sustainability and best practices, we separate all recyclable and donatable materials and make sure everything is disposed of responsibly. Payment is due upon completion.We are paperless: A receipt will be emailed to you. A tax-deductible receipt for items donated on your behalf will be mailed.